Some sites block Rite.ly Link Ads, (CTAs on URLs you can share anywhere). Some sites use code that blocks Link Ads. When you test a page from a site and find your rite.ly breaks to the original full URL, we may understand this to be a business decision on the part of the site owner. By blocking their site from being iFramed, which rite.ly does, there are pageview losses. There are prominent aggregation sites, such as StumbleUpon, which rely on the ability to iFrame other site's pages. So, for those that block iFraming, rite.ly's will break to original URL, your Link Ads will not display, but there is also a loss for them, which is why most sites do not do this. Here's how to check if a site you don't already know will display Rite.ly Link Ads, using either the Rite.ly dashboard or the Rite.ly browser extension. 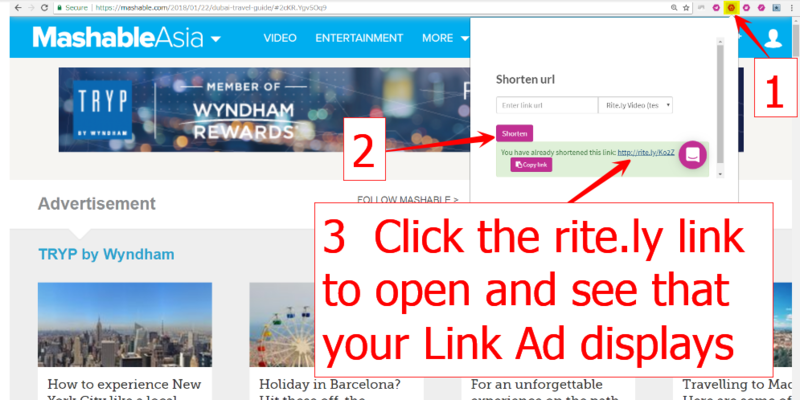 If you test one page from a site and your Link Ad displays or, in the case of invisible Link Ads (just for collecting viewers of your Rite.ly links in tracking pixels), if your link does not break to the original full URL, all pages from that site will allow your Rite.ly Link Ads. Have the RiteForge browser extension installed. Open a page from a site where you would like to share pages and click the RiteForge browser button. Under the page title and URL, to the left of the hashtag suggestions, click the back button in the RiteForge Composer modal (popup) that opens. Click in the rite.ly URL and then, the Test link, below. You can get browser extensions for Rite.ly, RiteForge and all RiteKit products at the bottom of the site.